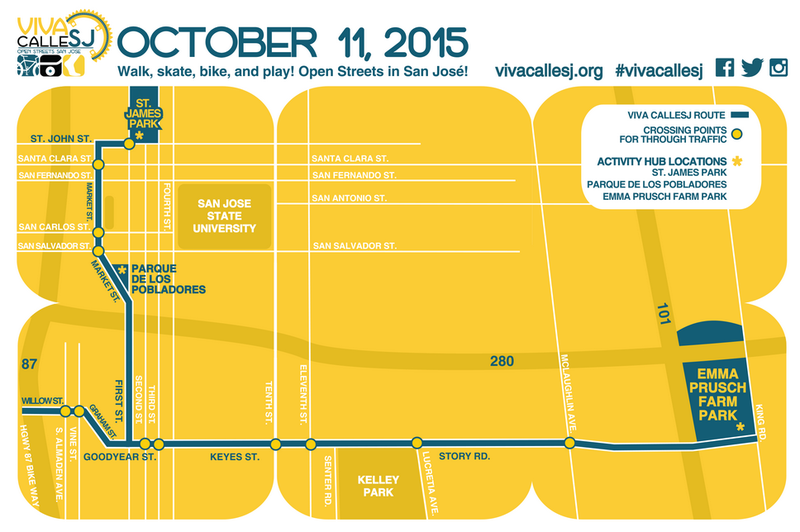 The San Jose Blog: Inaugural Viva CalleSJ San Jose! Inaugural Viva CalleSJ San Jose! The City of San Jose and the Silicon Valley Bicycle Coalition have come together to bring us an unprecedented event this October. Six miles of streets will temporarily be closed to offer the public a contiguous urban space to bike, skate, run, or walk. The event stretches from St. James Park all the way to Emma Prusch Farm Park in East San Jose. This is not a race and there is no beginning or end--you can start and end anywhere. This is a "first-of-its-kind" event and it sounds awesome. There will be three activity hubs: Emma Prush Farm Park, Parque de los Pobladores (SoFA), and St. James Park. These locations will have entertainment, activities, hydration stations, and vendor booths. The event will run from 10am to 3pm and more information is available at the Viva CalleSJ website over here!